Townhouse condo, 3 Bedrooms, 2.5 Baths, (Sleeps 5), 3 decks plus many extras. This beachfront designer furnished townhouse, The Bayberry By The Sea, is located in a quiet exclusive residential neighborhood at Kennebunk Beach. We've provided all you will need for a luxurious vacation at the beach whether you are a couple or a small group of up to five guests. Special off season rates are available. Enjoy the privacy and space of your own two story getaway where you see and hear the sound of the surf and feel the ocean breezes. Watch the surfers, lobster and sail boats or sit on one of three decks and read a book, go for a swim, walk the beach, or hike the paths at nearby conservation preserves. You are only one mile from gourmet restaurants, art galleries, boutiques, and antique shops in Kennebunkport and 35 minutes from charming Portland, ME and Portsmouth, NH. You may even take the train into Boston for the day. Our fully equipped kitchen provides you with all the staples - coffee, tea, sugar, flour, herbs, spices, condiments and everything you'll need to prepare a gourmet meal. We have a ceiling fan in each room for your comfort and hardwood floors throughout. All three bathrooms have recently been completely renovated. This is the way luxury vacationing should be! Please open the attachment of Available Items. May - October we rent by the week, Saturday - Saturday. Off season we rent for a minimum of 3 nights. We vacationed in Kennebunk for many years and love being close to the ocean and the charming area. It was a big decision to buy our townhouse as we live in Connecticut. It has turned out to be a great joy for us. The ocean view, beautiful sandy beach and lovely quiet neighborhood were too much for us to resist. There is so much to do in the immediate area we never get bored - great dining, sophisticated shops, art galleries, antiques, golf, walking the beach, sailing, and hiking on trails all keep us busy. The short drive to Portland, Portsmouth, Freeport, Camden - there is no end to the places to discover. We work very hard to provide everything our guests might need. We want our guests to relax and enjoy some luxuries along with our very special view, sounds and fresh air of the ocean. We believe that we provide more for our guests than any other facility on Kennebunk Beach. toilet, On the floor with the living area and small bedroom. We have recently completely refinished all three baths. We are right at Kennebunk Beach. Watch the waves roll in, feel and smell that fresh ocean air, and sleep to the sounds of the ocean. We are located at a beautiful 1500 yard sandy beach. We provide beach chairs for your use. All of rooms , except one, have an ocean view. We also have an ocean view and from two large 12 ' x 24' decks. These decks have tables, chairs and chaise lounges for your use. Our small deck has a river view. You may make local calls. We also provide a notebook computer for your use. A notebook computer is available for your use. We provide parking for two cars. We have a couch, love seat and two large chairs in the living room; also TV with cable and books and games. We provide herbs, spices, condiments, sugar, flour, tea, paper products, plastic bags and wrap, and much more. We provide extensive dishes, pots and pans, utensils, herbs, spices, condiments, sugar, flour, tea, paper products, plastic bags and wrap, and much more. You only need to bring the food. We have a dining table and chairs for six guests. Both ocean side decks also have tables and chairs for outside dining. Several books are available for your enjoyment. We provide a variety of CDs for your use. Games in the armoire and children's beach toys are provided in a box in the basement. We also have one small deck with a river view. It has two chairs for your use. Two 12' x 24' furnished decks on the ocean side. Tables, chairs and chaise lounges are provided. The Webhanette Golf course is less than one mile. Other courses are in the area. There are seven steps to get into our first floor and 13 steps up to the upper level. We have beach/water views from every room except one plus two large decks on the ocean side. Luxury linens and towels are provided. We provide numerous kitchen supplies like sugar, flour, coffee, tea, herbs and spices, condiments, and much, much more. A list of items is available. My sisters and I spent a week in this condo. It was so spacious, bedroom for each of us and 2 full and one half baths. The condo was clean and updated. Gay, the owner, was in touch if we needed her. The week there was more than we hoped for, it was wonderful and we hope to go back. So glad you all had a great week. It is a wonderful area with so much to do and so many things to see. Of course it is just great to sit on the deck and watch the waves. We hope you return next year! Loved the condo! Great location, spacious, and walking distance to town. Fabulous ocean views and nicely decorated. The owner did a nice job making sure the condo has everything you could want or need and quickly responds to questions. I wouldn’t hesitate to book this place again in the future. Thanks Pam. We are glad that you had a good stay at Bayberry. We work hard to provide everything we’d want in a place and it’s nice to know it’s appreciated. We had a wonderful get away at this condo. It had everything we needed, was very clean, decorated tastefully and comfortable. We were able to relax, take walks on the beach and enjoy the many fun shops and delicious restaurants in the area. Gay was great and kept in touch, though we didn't need her for anything but to say thank you for such a lovely stay. We hope to return again! The attention to detail exceeded every expectation. This home exudes wonderful energy. I love to cook and the kitchen is well equipped and easy to maneuver. Dining in the ocean view dining room and on the ocean view deck is perfect! The bedrooms are nicely decorated and quiet. The location to town is convenient and it is nice to be lulled to sleep by the ocean roar. I highly recommend this condo. The owners are a pleasure to deal with and a wealth of local information. location and always go home knowing how wonderful it is. We love this place. Our beautiful beach is available for you to enjoy for walks and swimming. You will see, hear and smell the ocean all day and night. There are fabulous restaurants, antique shops, art galleries, and boutiques all within one mile. There are numerous nature preserves with trails for short walks or long hikes. There are many things to do in the immediate area plus charming Portland, ME and Portsmouth, NH are just 35 minutes by car; Boston is a short train ride away. 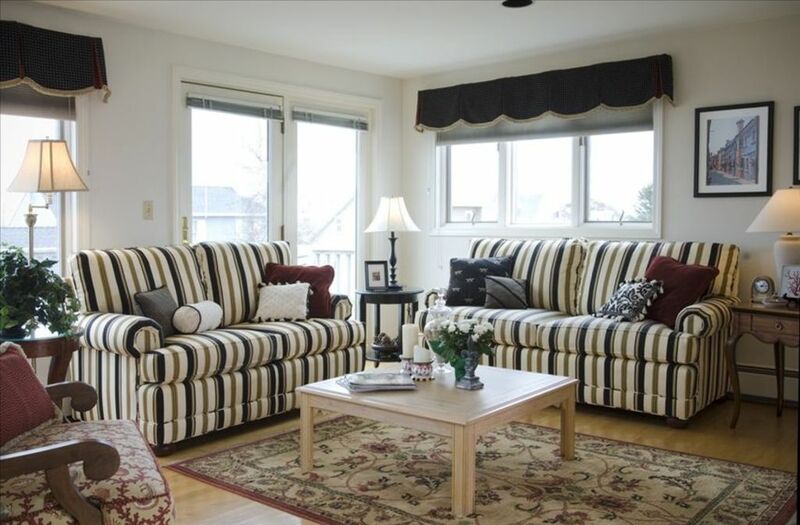 In addition to our rental fees guests are required to pay the seven percent Maine tax. All cleaning fees are already included in the rental rate.